I think we could really use a basic DJ style filter. Haha sorry, I had forgotten about this... is there really no such thing, or is it just impossible to find in the App Store? I've really dug. Not finding anything. Can kinda use dubfilter, but it's got a weird sound. 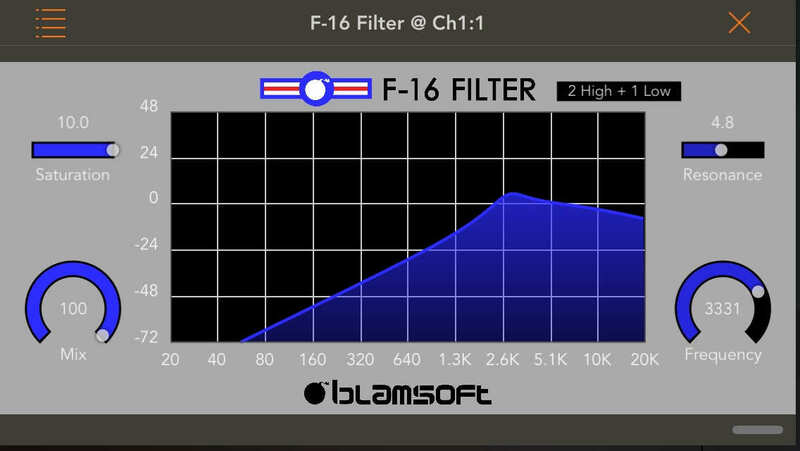 Blamsoft F-16 filter. Check out the filter modes to verify that it will meet your expectations. It sounds very nice. Wish it had an envelope follower, but that’s not needed for a DJ filter. 2 pole high pass + 1 pole low pass - this mode is combined. 3 pole high pass + 1 pole low pass - combined again. Saturation to get the character of some of the early Bozak rotary mixers, mix, freq, resonance. Not sure if the controls can be assigned to a midi knob. Wont give you what you need? I think the idea is that it is just one knob to rule them all. Audio Damage Filterstation 2 is pretty close to being what @MonkeyDrummer wants. Just set it up with two Brambos X/Y pads from Rozeta. The MS20 filters are especially tasty as is the sophisticated return path IO saturation. Far better filter modeling than the Blamsoft for my money. I don't think folks get the idea of what I'm talking about. Turn right for hp, turn left for lp, at 12:00, no filter. Maybe another knob for rez. If AUM's midi curve in the mapping section allowd a bit more control I could just use AUMs filters. I think I understand what you’re talking about, but I wasn’t sure if Blamsoft f-16 could be controlled with midi. Installed Blamsoft filter, opened in AUM, set to 2 pole hp + 1 pole lp preset ( filters are parallel in this setting ). You want it to sweep from lp, to flat, to hp, correct? It’s probably not technically flat at 12:00, but it sounds close. Assigned art kerns midilfo’s to frequency of the filter, because I don’t have a midi controller with me. It does what you want. As jonmoore said, Filterstation2 works as well. To create a DJ type filter choose the parallel filter setting, one lp, one hp, assign middle control to frequency. You’ll need to assign your controller to 2 frequencies in Filterstation2 ( lp, hp). The ms20 filters are indeed tasty! I use both Filterstation2 and Blamsoft f-16. They sound different to me. Both are useful. I find Filterstation2’s filters more precise. It’s definitely more flexible. @Max23 it sounds to me like it could be resonance... is there a resonance (or Q) setting in those Apple filters and are they turned all the way down?